Indian space engineers initiated the 440 Newton liquid fueled engine firing precisely as planned during a critical nail-biting burn lasting some 22 minutes. The Trans Mars Insertion (TMI) firing propelled India’s Mars Orbiter Mission (MOM) away from Earth forever and placed the spacecraft on course for a rendezvous with the Red Planet on September 24, 2014 – where it will study the atmosphere and sniff for signals of methane. The Mars insertion burn imparted the vehicle with an incremental velocity of 647.96 meters per second (m/sec) consuming 198 kg of fuel. The maneuver dubbed ‘The mother of all slingshots’, enabled MOM to finally achieve escape velocity and catapulted the 1,350 kilogram (2,980 pound) spacecraft on an historic flight streaking towards Mars. And in a rare but rather delightful coincidence, MOM is not alone on her remarkable Martian sojourn. Following the triumphant engine burn, she now joins NASA’s MAVEN orbiter in a gallant marathon race to the Red Planet. MOM’s journey began with a picture perfect Nov. 5 liftoff atop India’s highly reliable four stage Polar Satellite Launch Vehicle (PSLV) C25 from ISRO’s Satish Dhawan Space Centre SHAR, Sriharikota. The MOM spacecraft is now traveling on 300 day long interplanetary voyage of more than 700 million kilometers (400 million miles) to the Red Planet. 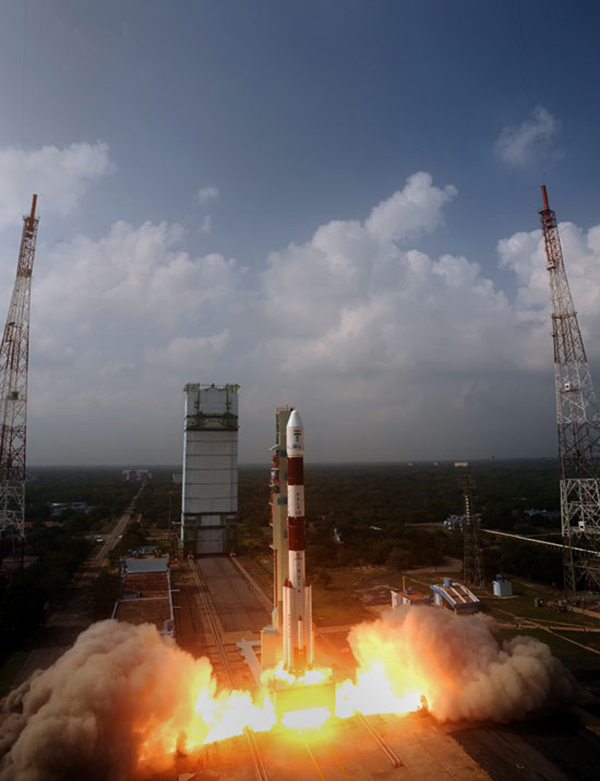 Along the path to Mars, ISRO plans to conduct a series of Trajectory Correction Maneuvers (TCMs) using MOM’s Attitude and Orbit Control System (AOCS) thrusters to precisely navigate the probe to the point required to achieve orbit around the Red Planet. Following the ten month cruise through space the orbital insertion engine will fire for a do or die burn on September 24, 2014 placing MOM into an 377 km x 80,000 km elliptical orbit around Mars. MOM will reach Mars vicinity just two days after MAVEN’s arrival on Sept. 22, 2014. If all continues to goes well, India will join an elite club of only four who have launched probes that successfully investigated the Red Planet from up close – following the Soviet Union, the United States and the European Space Agency. Dr. Ken Kremer is a speaker, freelance science journalist, scientist and photographer (Princeton, NJ) whose articles and space exploration images have appeared on TV, magazines, books and on websites. Ken has presented at numerous educational institutions, civic & religious organizations, museums, conventions and astronomy clubs. Ken lectures on both Human and Robotic spaceflight. Ken has a PhD in Organic Chemistry and over 25 years of Research & Development and Manufacturing experience in the US, Europe & South America. Ken has written over 600 articles. He has 3 dozen scientific publications including 17 US Patents. He has witnessed about 3 dozen Space Shuttle & rocket launches. Ken has been a science & space consultant to NASA, JPL and various news organizations across the US, Europe and Asia.